Although an onion usually requires soil to produce another onion, you can grow an onion plant with nothing more than a jar and a little water. This method of growing plants in water is known as hydroponics. It is a fun experiment to try during the winter when it is too cold for planting outdoors, and the shoots that sprout from the onion are edible as well. Select a firm onion that has a good root system. 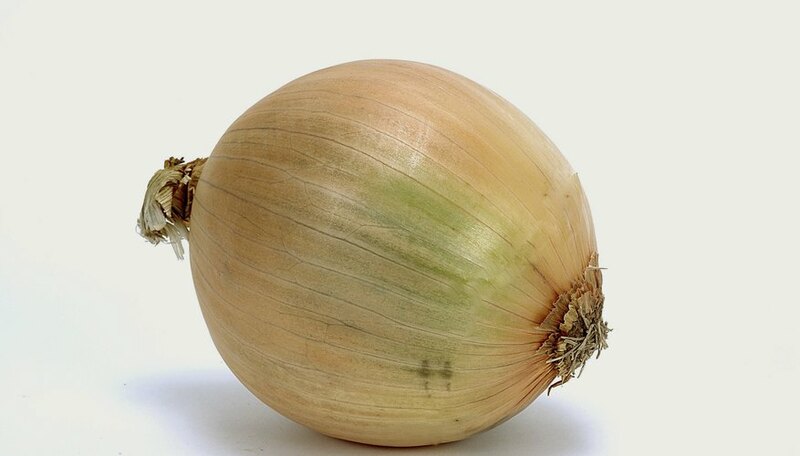 The root system or nib of the onion is located on the bottom of the onion. Fill an empty pickle or Mason jar three-fourths full with water. Stick one toothpick into each side of the onion. Insert each toothpick 1 inch into the middle part of the onion. The toothpicks hold the upper part of the onion out of the water. Put the onion bottom into the water with the toothpicks resting on the edge of the jar. Place the jar in a warm location near a window where it receives indirect sunlight. Shoots from the top of the onion will appear in approximately five to seven days. Based in Atlanta, Casey Kennedy has been writing online content since 2009. She specializes in writing about small business, careers, real estate, and ecommerce. She also enjoys writing about a variety of other subjects, including home improvement, gardening, and pet care. She attended the Academy of Art online, studying interior architecture and design while pursuing commercial flight training at Aviation Atlanta in Georgia.